3My heart was racing, because I had just made a fool of myself. On purpose. I had just performed on an open mic comedy stage at a local bar. Some time during the last century, an alter ego of mine used to sing silly, provocative songs at places like this. I don’t even remember why I stopped, but here I was two children, a mortgage, and a daily commute later, when I became aware that the Mt. Kisco Tavern was hosting this mic less than a mile from my house. In my head, I hadn’t stepped in front of a microphone in 15 years, but based on the location, this may well have been a sign from God. I led with my signature song, “I Don’t Wanna Go to Work” As usual, half the audience glared at me until they realized the other half was in stitches and then I had the whole crowd under my spell. My comedy songs had always gone over well. After the show, I spoke to a guy who produces these kinds of open mic shows at bars. I’m always in reverence of guys who didn’t leave their creative spark behind. Well, that’s not true, you never leave the spark behind, but I respect guys who never let the flame go down. I told him what I do for a living – produce business to business forums for senior executives – and he seemed impressed. This is all wrong, I thought. I’m just a working stiff! He’s the one who produces exciting events! It wasn’t until later that night that it occurred to me that I was the one who was wrong – producing content driven events for a corporate audience of hundreds is actually the big time. And it was I, not he who did this for a living. I had never thought of it that way before. The problem is, most people in the conference industry don’t. Our managers are usually focused on the next event’s balance sheet before the current one even runs. I’ve worked for people who seem annoyed that we’re traveling for the event instead of sitting in the office working on the next one. Over the course of the following weeks, I read a few books on comedy as an art form. More than once, these books mentioned that a good job for a working comedian was to be a professional emcee. Again it occurred to me, I already was a corporate emcee. Dipping my toe into stand up comedy gave me a new perspective on this odd career of conference producer. What else were we already doing that we hadn’t realized before? This is why I wrote “Producing Success: The Only Career Guide for Conference Producers.” There is a lot of vitality to this role, but it really is up to us to find it. If you let yourself get buried by the numbers, the gossip, the office politics, and the uncertainty, you will burn out quickly. But if you learn to see the opportunities that lie behind all the noise, there is no telling where this career will lead you. 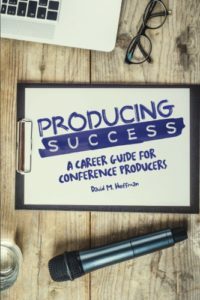 Producing Success: The Only Career Guide for Conference Producers is available on Amazon.com. Buy it now!